Up to 50 practices in England will be selected to join the 73 currently testing a new approach to dental care. The new system incentivises dentists to offer full oral health assessments and self-care plans on top of traditional treatments. The recently published evaluation report from the first year of testing recommended that a further group of dental practices should be recruited into the programme. The new practices are currently being selected and will join from October 2018 and January 2019. The existing 73 practices are continuing to test the new approach, with a new remuneration system added which supports dentists carrying out preventative work. 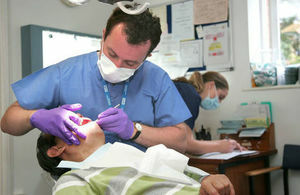 The scheme could be rolled out nationally from April 2020 if it can be shown to benefit patients, the NHS and dental practice following a thorough evaluation. "The government has made great progress in improving the oral health of patients and tooth decay among children continues to decrease ‒ but there is more we can do. "Our new proposed NHS dental contract focuses on prevention and quality of care and will be thoroughly tested to ensure it is financially sustainable for the NHS, patients and dentists." "The announcement of up to 50 more prototype practices is an important step in developing the NHS dental service in this its 70th year. "I welcome it and hope that further refinement and testing with the profession will lead us to a model that enables dentists and their teams to play their full part in the delivery of integrated care and further improvement of oral and general health."